5/20/07: We are sorry to report that Martina was accidentally electrocuted at her home in May 2007. We are leaving this interview up in memory of her enthusiasm for sled dogs and life. 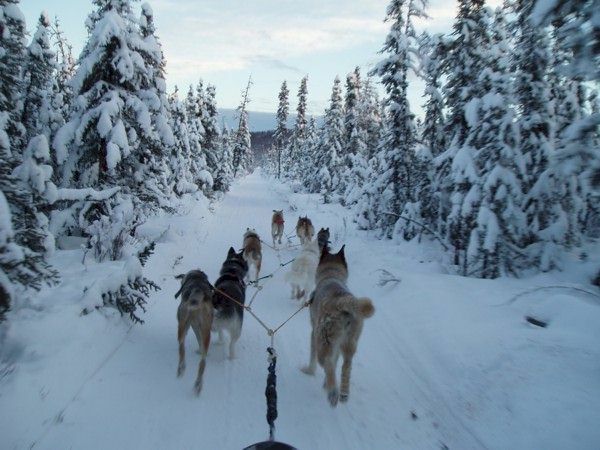 I am the only dog musher in my family, and the only member of my family currently living in Alaska. I have a younger sister that just joined the US Army, and my parents are getting ready to enjoy some long awaited traveling in their upcoming retirement. I have been a member of ADMA (I need to renew my membership for this season) and have raced someone else's sprint dogs a few times. This year I volunteered to help with the Iditarod's pre-race blood draw here in Fairbanks. 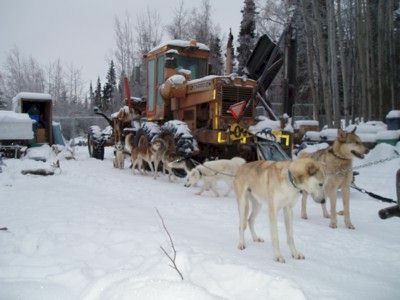 I met a couple mushers that I know, and several that I didn't. I'll probably do it again next year. It was a great experience. Aside from running dogs and the grader, I have a few other passions. I am also a graphic artist. Mostly by hobby, but I have done some commercial art. I designed the logo for the 2004 Yukon Quest race patch and pin, and have a few sled dog cartoon postcards that are sold at Cold Spot Feeds. I intend to pursue a career in veterinary medicine. Animal behavior is a particular area of interest. I enjoy working with shelter dogs. I socialize them and teach them basic doggie manners, to make them suitable as pets. I enjoy working with them because it's very rewarding to see how they develop. Many have turned out to be great workers! My biggest challenge, currently, is to form a group of these shelter dogs into a cohesive team, suitable for competition. I've had sled dogs for the past 8 years. I haven't always had this many, though. I started out with just one, that then became two, and three. After the fifth one, the numbers increased a bit more rapidly. I originally wanted one companion dog that would be best suited for my lifestyle. I wanted a dog that wasn't a "one person" dog, since I am in the Air National Guard, and may have to leave a dog with a friend for a while. I also wanted a dog that enjoyed being outside in the winter and could handle harsh conditions. So, I chose a husky. 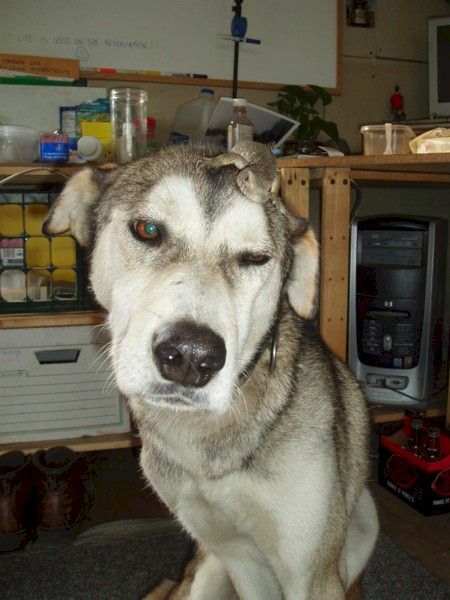 The fact that my first husky was overweight was what got me more actively involved in mushing. Once I got her a companion (I had underestimated the pack-instinct of huskies) and I had two dogs to hook to a sled, I was pretty hooked on the idea of getting a couple more. I don't think I ever really intended to acquire quite this many. It just sort of happened. The first team I put together consisted of my three original dogs, Nosha, Deo, Rahya, and the newly adopted Shaman, and my friend Andy's Australian shepherds...one of which was his mom's show dog that he was pet-sitting! My first "real" team of dogs were Joyce Tuttle's sprint dogs. I remember it clearly! At first, I wasn't sure the four little hound dogs she'd hooked up would actually pull me. I envisioned myself having to do a lot of running behind the sled. I had NO experience with sprint dogs! I was caught completely off guard when they shot out of the yard like a rocket! The dogs tore down the icy driveway and hung a hard left on the road. Of course, the sled continued straight... into the snow bank on the other side! I was able to hang on (thanks to the death grip from years of working road grader controls! 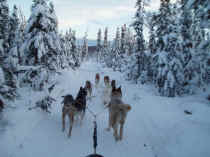 ), right the sled, and catch up with Joyce at the highway crossing. I got the team stopped, but as we went across the dry pavement, a runner caught, flipping the sled again. I didn't want to stop the dogs on the road, so let them drag me across the highway on my back. I stopped them just before getting into the trees. That was a rush! And a real eye opener! 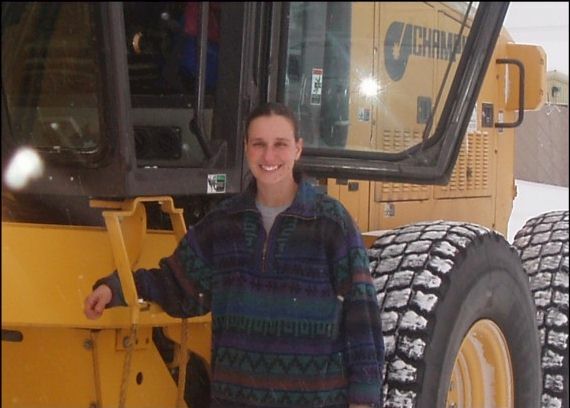 That's also why I wear insulated Carhartt coveralls for training. Not only do they protect against the cold, they add a lot of padding for those unexpected spills! The rest of the run went pretty smoothly. I learned a lot about handling a strong team at high speeds from that experience! You definitely have to pay attention and be prepared for the unexpected... ALWAYS! I can really credit the late Joyce Tuttle, my landlord who's sprint dogs I raced, Fred Lee, and Aliy Zirkle of Two Rivers. I currently have 25 dogs, with about 20 of those being capable of competitive training. I have about 15 tie outs, which are 4.5' metal pipes cemented into old pickup truck tires. This is nice, because I can move them around from time to time, as I develop my yard. I dig out a shallow hole, just the size of the tire, which prevents dogs from tipping the contraption over and pulling out the little rebar swivel. I currently use 6' chains on these tie outs. I also have large kennel runs (about 600 - 900 ft sq). I have 3 of these that are made from chain link kennel panels that have been reinforced by tying the chain link to the frame more securely with 12 ga galvanized fence wire. I like these panels because they're easy to disassemble and reuse, if you want to rearrange your yard. I'm constantly rearranging my yard! I'm currently working on a wooden fence and some permanent kennel runs. I like to connect adjacent kennel runs with a gate, as well, which makes it really easy to socialize dogs. I prevent digging out or in by laying some hardware cloth wire on the ground underneath the fence panel. There's at least 1.5' of 19 ga wire with 1/2" square holes protruding in either direction from the base of the fence. I haven't had any dogs dig under the fence with this new setup. In addition to the kennel runs and tie outs, I currently have three fenced yards ranging from about 600 ft sq - 1/2 acre. I like to rotate dogs between these accommodations, letting them spend some time on a tie out, and also in a large running yard, and in a kennel run with a buddy. In the winter I like using little 1 gallon plastic buckets as food dishes. During the summer, I'll use the plastic buckets and also regular metal dog dishes. Socialization and mental stimulation are just as important as keeping them clean and parasite free. I like my dogs to have an opportunity to run and play with each other, and engage in "regular" doggie activities when they're not running in front of a sled. This is very important in my kennel, when work or weather prevent me from running them as much as I'd like. I mostly feed dry kibble. I like to mix the different brands of kibble, so they don't develop the sensitive stomachs sometimes associated with dogs that eat only one particular variety of dog food their entire lives. 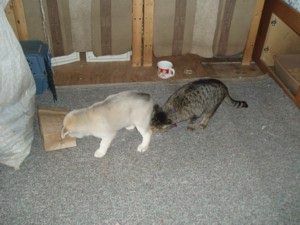 The staple of their diet is usually Red Paw or Eagle brand kibble, supplemented with whatever is in the "bulk dog food" bin at Cold Spot Feeds. While training they're fed and watered twice a day. During the off-season, due to my busy work schedule, they're fed once a day. In the summer, each dog has a 12 gallon galvanized bucket filled with water that I change when it gets dirty or starts growing anything. That way, they can't tip it over, and they always have water available. In the winter I supplement their food with cooked fish and game meat, rice, fat, dry kelp, and a few other odds and ends. My kennel management style is basically "trial and error". It's something that's constantly evolving. 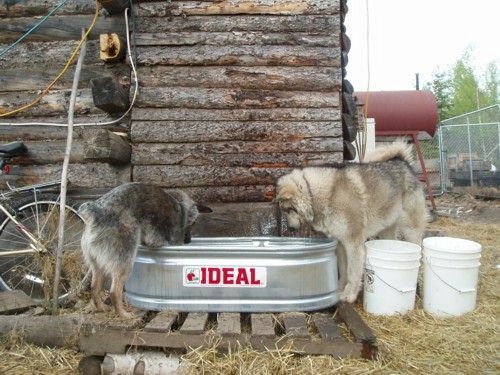 The main focus is keeping the dogs happy and healthy. I'm constantly discovering new ways of doing it. I just try something. If it works, I stick with it and try to improve it, and if it doesn't, I try to figure out why, so I can make better decisions in the future. I work with husky mixes. 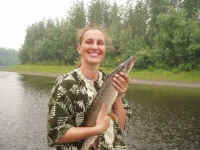 Most are the typical Alaskan Huskies you'd find in distance racing or on a trapline. I don't have too many dogs with high percentage of hound. Most of my dogs are adopted from the local animal shelter. I have dogs ranging in size from 35# - 85#. The only real requirement is that they are physically healthy and free of deformities and other debilitating ailments. I have dogs that are long legged, short legged, barrel chested, lanky, ... you name it! For me, temperament is a big factor in deciding to work with a dog. I don't work with aggressive dogs. I don't have the time or resources to devote to those issues, so I don't even accept them. I work with a lot of shy dogs and dogs which haven't had much socialization. It's very rewarding to see them come out of their shell and gain self confidence. They become completely different animals! Nosha, my first dog. She traveled all over the US and Canada with me in a tractor trailer. She was the first dog I ever owned on my own. I adopted her from a rescue in Tennessee as an overweight, neglected animal. Once her weight was reduced by long walks, I carried a bicycle and a small dogsled on the back of the truck. After delivering freight, we'd go mushing (very slowly) or bicycling, depending on the season. She was my constant companion, and the dog that originally got me into husky rescue and mushing. Unfortunately, she was killed in a bear attack the year I moved to this cabin. It is also because of her that I now work part time as a veterinary technician at the After Hours Veterinary Emergency Clinic in Fairbanks, and am still planning to continue pursuing a degree in veterinary medicine. 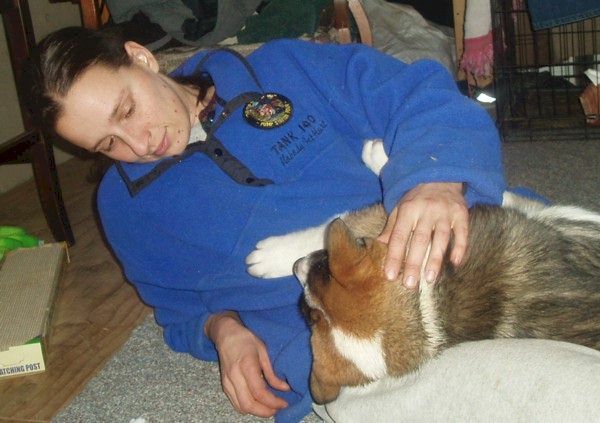 It is really because of her that I started working with huskies from the local shelter, which has evolved into the Long Haul Kennel, named for it's humble beginning in a long haul tractor-trailer operation, and also the philosophy that we're in it "for the long haul". Misha is another little angel that is no longer with us. This little houdini could escape from anything. She was so tiny (a little 35# sheltie/husky mix) that I hadn't thought of putting her in the team. She was primarily just a housepet. After escaping a couple winters ago, and losing two toes by winding up in a trap that some jerk had set out in his driveway for the specific purpose of trapping neighborhood dogs, I decided to give her a try in the team. She definitely needed a job. She did great! She really enjoyed it, and seemed very happy with her new job. When her little foot would get too cold or sore, I'd put a booty on, and she'd run along happily. She was a real joy. A very loving little dog, and Sasha's best buddy. They'd been adopted from the shelter together as pups. Unfortunately, the little houdini continued escaping in the most creative ways over the summer. One day, she didn't come home. I miss her dearly, and continue to work on yard security to prevent future break outs of even the most determined dogs! First and foremost, a good temperament and disposition. Good work ethic, tough feet, good coat texture, good metabolism, and healthy eaters. The two dogs in question would have to have physical attributes that complement one another. It is also important that the parents have a history of good health. Any dog that's physically healthy and willing is trainable. How well they do just determines what type of activity I will primarily train them for. After they watch us leave the dog yard, most are eager to join in when their turn comes. It depends on the temperament of the pup, whether I harness the little critter into a small team directly, or let it follow along, loose. Different things work with different pups. The more reluctant ones will get to wear a harness and then drag a small object around the yard, whereas more assertive youngsters can jump right into a small team without hesitation. You just have to get to know the pups to figure out what will work best. Good physical health and eagerness. Any dog that's willing gets a chance. Every dog that wants to makes the team. The question is just... which team? I group dogs together based on their speed and enthusiasm level. Some young dogs do great, right off the bat, and others have taken as much as two years to really get into it. As their speed and ability changes, I reevaluate which teams they'll run with. The goal is "everybody has fun, and nobody gets hurt". It's a work in progress, and we improve a little bit at a time. The most important thing is to enjoy the experiences along the way! I am hoping to run a sprint team (for my faster little guys) and a mid distance team this next season. I use primarily (if not exclusively) rescue dogs. My goal is to raise awareness for shelter and rescue adoptions. Most of the dogs in my team are adoptable to the right homes. There should be constant overall progress. It may not always be much, but there should always be progress, whether it's speed, team cohesion, or attitude. And, of course, to walk away from it all with as few injuries as possible. The old "beater" sled! This is the sturdy, but lightweight, not too expensive (if you have to replace it), probably not too pretty thing that you don't mind tearing up a little runner plastic on, when trail conditions aren't optimal. This coming season will be the first season I'm racing my own dogs. We'll be choosing our events based on location...I'll be starting with the local races this year. Also, the condition of the dogs. I'm hoping to have a team for the sprint competition in the spring, and also for the shorter mid-distance races in the interior, beginning with the Two Rivers Tune Up. I can handle a team well, and although I really hate to jinx myself by saying this...I've never lost a team. I can credit my death-grip to any part of a dogsled to the incredible workout I get from my full time employment as a grader operator. I also realize that I am pretty new at this, and have a lot to learn, so my ears and eyes are always open. I'm not ashamed to admit that I've made mistakes, and I try to learn from them. I don't have much competitive mushing experience. I would like to find realistic ways improve training and husbandry methods, to reduce the number of dogs that are culled. And, since my kennel is a non-profit rescue kennel, I would like to raise awareness of the fact that with a little effort, sled dogs can also be great pet dogs in the right situation. In my limited opinion; training, persistence, and patience! I'd like to see a constant improvement in the relationship with the non-mushing public, and of course, the care and keeping of working dogs. Be responsible in the development of your breeding and training programs! Mentoring newbies is a great thing, too. Let people learn from the mistakes you've made, so they don't have to make them all themselves, at the expense of the dogs or their sanity. Getting people interested and involved, and providing a resource for beginners to become better informed before jumping in head first, themselves! Get the type of dogs you are most comfortable living with as pets, and then see what opportunities there are for you and them. You'll be much happier in the long run, than if you have a yard full of high strung hounds because you like short races, but you discover that you can't stand high energy, barking dogs! Whichever type of dog you choose to work with, make sure you like the dog's attributes, because you'll be spending a LOT of time with them! Also, never run a team larger than you can comfortably handle during training. You never know what can pop up out on the trail...moose, loose dogs, equipment malfunction, etc. Start small and increase gradually. I didn't always have chain tie-outs. I only had 12 dogs at one time, and kept them successfully contained in fenced yards. One winter morning, after hearing a commotion, I looked out the window to see all of my dogs in the driveway, on the wrong side of the fence. Of course, this is where I'd been storing the garbage bags awaiting a trip to the transfer station. So, I threw on some boots and a sweater and ran out to open the gate and let all the dogs in. I figured it would take them a while to squirm back out of whatever hole they created in the fence. Well, I had just enough time to go back upstairs and look out the window to discover all the dogs milling around the garbage, which they had dragged all over the driveway and underneath both the grader and the pickup truck! So much for getting back to sleep. I went outside with a flashlight and began walking the fence line. I had been expecting to discover a pretty good sized hole, since even the monstrously tall 85# dog was loose, but I was completely unprepared for what I found. A moose had apparently trampled a good 10' section of wire fence, including posts, completely flat! Not only that, but the noises coming from the woods just beyond the fence made it clear that the culprit was still hanging around! 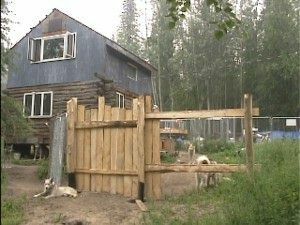 I had all 12 dogs locked in the cabin by themselves for about 4 hours, while the moose milled around in the driveway and I tried to hastily repair broken fence. That summer I put in some chain tie-outs. Whether I use them all or not, my goal is to have enough for all dogs in my yard, plus a couple extra! 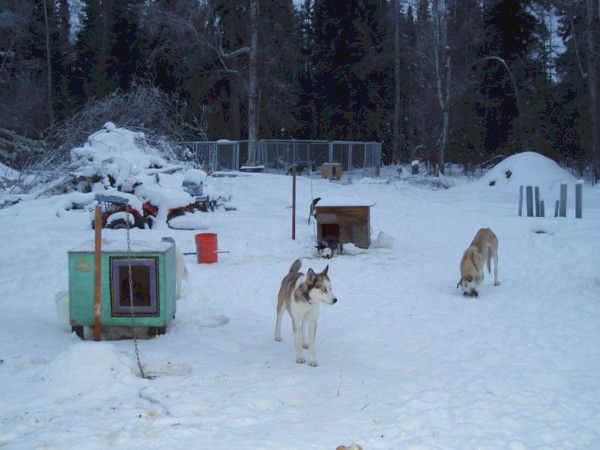 I learned a lot about canine fertility from my sled dogs, as well. Since nobody in my family has ever bred dogs, I had never had any first hand experience with the issue. Also, I mostly take in shelter dogs and rarely any intact animals from private individuals. I had been under the impression that females can only get pregnant when they come into heat, which is about twice a year, six months apart. So, I didn't think anything of it when I put an intact male and female in a pen for a while. She'd been in heat over a month prior. Well, a few months later, I noticed that particular female gaining weight in a rather peculiar way. There seemed to be nothing else wrong with her, so I just kept her under observation. I had just decided to take her to the clinic for an x-ray, when the mystery was solved. I came out the next morning to feed dogs before going to work. I heard an unusual squeaking sound coming from Mauja's pen. I found the sound to be coming from some little critter writhing around in the dirt. My first thought was to get it out of there before a dog ate it! I figured that the dog's seeming disinterest in the little "morsel" was probably due to my arrival with a bucket of feed! It wasn't until I picked it up and brushed the dirt off that I realized what it was. A puppy. Again, my very first thought (albeit just for a split second) was "where in the world did a puppy come from?!" Then, all of a sudden (you could probably see the light bulb come on) I realized what had been "wrong" with Mauja all this time! It's rather embarrassing, but true. I called in to work and took a sick day, and brought Mauja into the cabin to have the rest of them under my bed. It was a flawless delivery. I had been so worried, since working at an emergency veterinary clinic, I'd only seen the deliveries that go wrong. I'd never witnessed natural dog birth before. It was an amazing experience! I just wish I'd been a little better prepared! Fortunately, a few fellow vet tech helped me out with "puppy sitting" while I scrambled around to get everything set up for the litter. One of the little critters has found a home with a loving family, and the others will be joining the working dogs here this next winter. I have found myself shaking, on the runners, holding a team of 8 eager dogs, because there's a moose grazing lazily in the trail about 100 feet ahead, that's showing no interest in moving! Then, I notice her calf trot out to join her. Oh boy. Everything turned out Ok. There was no way I was going to be able to turn the dogs successfully away from that on the narrow trail! I just kept an eye on the moose. I shouted at it, and let the dogs "lunge" toward it a couple inches at a time. I wanted to seem as unthreatening as possible, but be as obnoxiously loud and annoying as possible, so it would go find a more "peaceful" place to graze...somewhere away from the dog trail! Don't know if my reasoning was sound, but it worked in that situation. Whether you're into competition or just recreation, it's a great activity to enjoy with your pets! Don't limit yourself to what everyone else does, but be adventurous and find something that works for you! There are so many different ways to enjoy winter sports with dogs, that there's something for everyone...no matter what kind of dog you have, or how many!